Technology can be a farmer’s best friend, but it can also be a farmer’s biggest foe. With extensive weight and large moving parts, farm machinery creates a substantial risk of injury for operators and others in the vicinity. It only takes a split second for severe injuries to occur, particularly when the farm equipment is defective. At Larson Law Firm P.C. our legal team has experience with North Dakota’s agricultural safety regulations. When representing your case, our knowledgeable North Dakota lawyers examine and research every aspect of the accident, so we can accurately determine the cause of your injuries. Our personal injury attorneys aggressively work to hold all liable parties accountable for their negligence, and to recover the damages you need and deserve. While numerous types of machines and equipment can cause farm accidents, tractors are among the most common. When these large vehicles encounter a sloped area of ground or particularly rough terrain, they can roll over, trapping the operator underneath. Tractor roll-overs often result in fatalities, leaving family members to deal with the tragic loss of a loved one. For financial reasons, many farmers choose to purchase used farm equipment. While this choice may be cost-effective, it also increases the likelihood of an accident occurring. Used equipment may be defective or worn out, causing it to malfunction without warning. Resulting injuries can be catastrophic, ranging from limb amputation and crushing injuries to a wrongful death. If you or a loved one was injured as a result of defective farm machinery or a tractor accident, reach out to our experienced attorneys. When you secure our legal services, you don’t have to worry about confusing legal paperwork that causes you more anxiety and stress. We handle every detail of your case, so you can fully concentrate on your health and well-being. Were safety devices, such as shields and guards, taken off the machinery? Did the power takeoff and safety shutoff suddenly malfunction? Was the farm machinery safely, properly maintained and serviced? Did the manufacturer fail to warn machine operators about possible hazards? Did the employer train their workers on how to safely use the machinery? A farm accident injury can be a devastating and traumatic experience for you and loved ones. With more than three decades of helping personal injury clients, our dedicated North Dakota farm accident attorneys tenaciously fight negligent parties and hold them accountable for your accident and injuries. When someone else’s negligence keeps you from working and paying your bills, they should be held accountable. 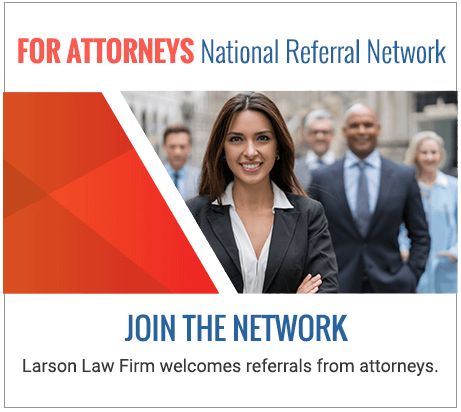 At the Larson Law Firm P.C., we work to make that happen by helping you obtain high-value compensation awards. We provide legal services to injured parties across North Dakota, including the residents of Ward, Williams, McKenzie, Pierce and Mountrail Counties. Our Minot office is easily accessible with convenient parking available. Contact us via our secure form or by phone at 701-484-HURT.